The asari are a graceful and charismatic people that hail from the Parnitha system in a remote corner of the galaxy far from Golarion's solar system. Long ago having mastered space travel, the asari committed themselves to the exploration of the galaxy and its uncharted worlds. 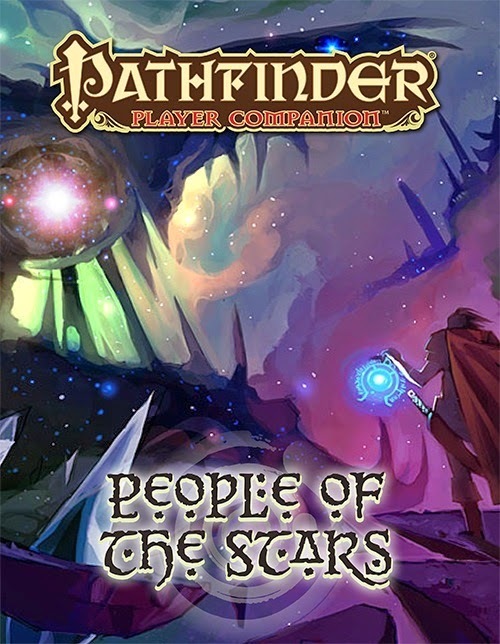 To their people, Golarion and the worlds near to it are unknown, and asari encountered here are likely long-range explorers hundreds of years away from home, or more likely lost and stranded with no way to return to their homeworld of Thessia. An asari illustrated by LuckyFK. 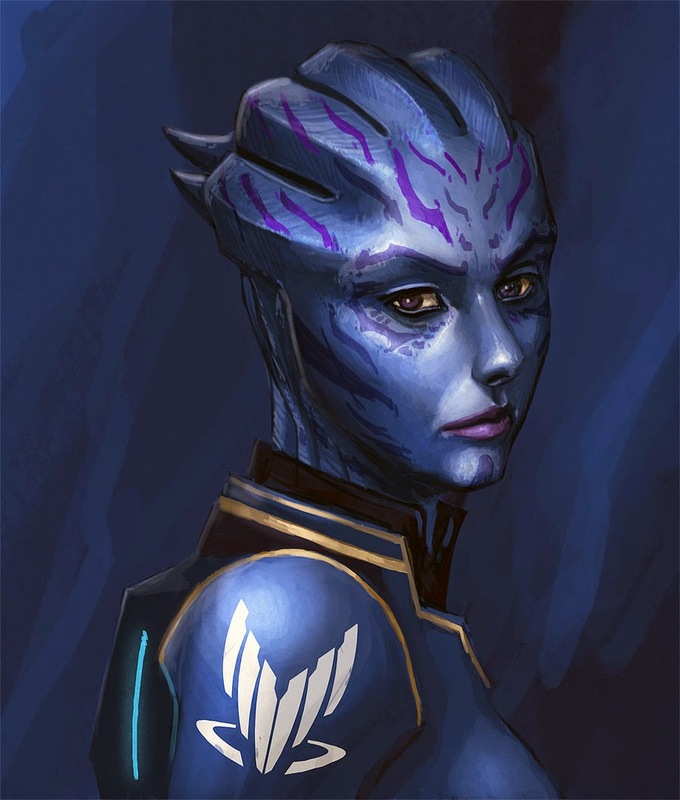 Unlike most species the asari are monogendered, genetically female and incapable of producing a male member of their species. As such, the asari reproduce asexually but require a genetic "map" from a partner species from any other race regardless of gender. The partner does not actually contribute genetic material, but through the asari's meld ability becomes part of a synthesized gene map of both asari and parent DNA markers, by which the asari bears and produces an offspring asexually. This process can cause the expression of some inherited traits from the other parent race to their offspring, though they are never expressed as physical changes to the asari form. Physical Description: Asari are a singularly female species and as such share common physical traits with other female humanoids. Their skin color ranges from pale shades of blue to deep purples and occasionally hues of teal or green. Some asari exhibit colorful stripes and other symmetrical patterns on their face and bodies in myriad color. These markings do not typically appear on "purebloods." Asari have no body hair and their heads are crowned with firm, cartilaginous ridges. The skin of an asari at their ridges is pebbly and tougher than the rest of their body. Some asari bleach or dye the skin of their ridges for fashion. Society: The asari are a balanced and pragmatic people with a centrist society that seeks to maintain stability politically, economically, and socially. They make long-term plans that affect generations of their people with great care and consideration, but on the same token find great difficulty in making urgent, immediate choices. An asari's life is divided into three climacteric stages: maiden, matron, and matriarch. Maiden begins at puberty and is marked by a desire to explore and experience all the universe has to offer. Young asari are often curious at their best and reckless at their worst, often attributing poor life choices made at this time to their desire to experiment and understand the worlds around them. The Matron stage begins around 350 years of age, or earlier if the asari begins a family at a younger age. Matrons are defined by a desire to settle down and develop a family. The final stage of asari life, the Matriarch, typically starts around 700 years of age. This can occur earlier if the asari does not develop strong paternal skills or attachment to a family unit. Matriarchs are active in their community as sages, scholars, politicians, and diplomats. They leverage centuries of experience towards the stability of their home communities and dispense ages of collective wisdom. However, each stage is largely a societal construct and there are many asari who live outside of this structure. Maidens who stay close to home, rather than explore. Matrons who would rather travel and explore rather than build a family. Matriarchs who have no interest in politics or community. But these individuals are often the outlier, not the norm. Asari families vary between single-parent and dual-parent, depending on the birth mother's choice of whether to involve the "father" in their offspring's life. In the case of pureblood asari, dual-parentage is common, especially in the early stages of development when the child is monitored for the expression of ardat-yakshi mutation. In the case of children born of an asari mother and a non-asari parent the asari usually raises their offspring alone, unless a strong emotional bond has been forged with the "father" of the child, or the asari believes that the other parent could contribute meaningfully to their child's development. Relations: Asari are an extremely long-lived race and have adopted a distant perspective on situations. Asari are comfortable with prolonged periods of observation and contemplation over issues important to them, and see the haste of shorter-lived races as frustrating and foolish. Short-term setbacks are viewed with less importance in ways that may seem aloof to other races. But elder asari can make plans that may seem erratic, but pay off in decades or sometimes even centuries. Since asari frown on intraspecies conception, since genetic traits and cultural insights are gained from procreating outside of their species, the asari often expose themselves to new and unfamiliar cultures to broaden their own species genetic pool and societal growth. New art, culture, magic, and technology are often absorbed from other peoples as a part of this exposure process. "Pureblood" is a great insult among contemporary asari, stemming from the rare genetic defect known as ardat-yakshi, and also the societal predisposition that "purebloods" are less cultured and more mundane. Alignment and Religion: Asari society is very lawful with little focus on morality and as such most asari tend to be lawful or neutral. However, young asari are often held to the expectation that they will be wild and reckless, so many begin with more chaotic alignments and become more lawful or neutral as they grow older. The central asari religion is known as siari, and is a pantheistic faith that translates roughly to, "all is one." Siarists believe that the universe is a single living entity and that every life within it is an aspect of a greater whole, and that death is a merging of one's spiritual energy back into the greater universal consciousness, but do not expressly believe in reincarnation on an individual level but rather that all races reincarnate into all other races and that their people are a direct expression of this experience. However, Siarism did not become popular until after the asari began traveling away from their own homeworld and discovered that they could meld with other races perfectly. Prior to this period, asari religion was vast and varied. Today, the strongest surviving old religion is of the goddess Athame, a deity of prophecy and fate that exists in three stages — maiden, matron, and matriarch — and became the foundation for these societal stages in asari development. Adventurers: Most asari adventurers are young, typically maidens seeking to explore and understand their place in the universe outside of their solar system. These untamed spirits come from a myriad of professions, though their natural grace and charm leads them to classes like bard, rogue, or sorcerer. Ability Score Racial Traits: Asari are naturally graceful and charming. They receive a +2 bonus to Dexterity and a +2 bonus to Charisma. Size: Asari are Medium creatures and thus receive no bonuses or penalties due to their size. Type: Asari are Humanoids with the asari subtype. Base Speed: Asari have a base speed of 30 feet. Languages: Asari begin play speaking Common and Thessian. Asari with high Intelligence scores can choose any other language as bonus languages, (except secret languages such as Druidic.) See the Linguistics skill page for more information about these languages. Focused Study: At 1st, 8th, and 16th level, asari gain the Skill Focus feat in a skill of their choice as a bonus feat. Gregarious: When asari successfully use Diplomacy to win over an individual, that creature takes a –2 penalty on attempts to resist any of the asari's Charisma-based skills for the next 24 hours. Sociable: When asari attempt to change a creature's attitude with a Diplomacy check and fail by 5 or more, they can try to influence the creature a second time even if 24 hours have not passed. Diverse Training: Pick up to two skills. These skills are always considered class skills for you. Meld (Sp): Asari may form a potent psychic bond with another creature, allowing them to exchange genetic information for procreation as well as memories. They may use share memoryUM once per day as a spell-like ability. Inherited Trait (4RP): Asari inherit one racial trait from the Feat & Skill category of their non-asari parent race. For example, an asari with a human parent could select the skilled or bonus feat trait. An asari with an elf parent could select keen senses. No single trait adopted in this fashion may have a value higher than 4RP. Emissary: Once per day, an asari can roll twice when making a Bluff or Diplomacy check and take the better roll. This trait replaces diverse training. Beguiling Liar: Asari gain a +4 racial bonus on Bluff checks to convince an opponent that what they are saying is true when they tell a lie. This trait replaces gregarious and sociable. Life Drain: An asari with this trait may cast vampiric touch once per day as a spell-like ability. This trait replaces inherited trait. Seducer: An asari with this trait is supernaturally charming and able to cloud the minds and judgment of others. You gain charm person once per day as a spell-like ability. This trait replaces meld. Multitalented: Asari with this trait are highly adaptive and may choose two favored classes at 1st level and gain +1 hit points or +1 skill rank whenever they take a level in either of those classes. This trait replaces inherited trait. Ardat-Yakshi: These asari from pureblood unions exhibit a rare genetic defect that renders them sterile and turns their ability to meld with other races into a life-draining attack. Ardat-Yakshi also have an ability to force their will on others. These asari have the life drain and seducer traits. Pureblood: The offspring of two asari parents, purebloods lack the varied genetic traits of their non-asari parent, but often push themselves to excel in multiple fields to make up for this percieved shortcoming. These asari have the multitalented trait.